That’s right, it’s mating season for buffalos . . . buffalo SCULPINS that is! Now that I’ve lured you to this posting with the procreation of a huge, shaggy terrestrial mammal on your mind . . . let me show you the spawn of this wondrous fish. The buffalo sculpin – Enophrys bison – has earned the association with buffalo/bison due to the horn-like spine found on each gill plate (operculum). The species can be up to 37 cm long. Male Buffalo Sculpin guarding eggs. April 1, 2012. Photo © Jackie Hildering. As is the case for many species in the sculpin family, male Buffalo Sculpins guard the eggs from predators and fan them with their pectoral fins to aerate them and stop growth of algae / bacteria. Sometimes they guard the eggs laid by multiple females. When you consider that a female can lay between 19,000 and 32,000 eggs, the males have a lot of fertilizing and guarding work to do! Their guard duty lasts 5 to 6 weeks until the eggs hatch. Another male guarding eggs on April 1, 2012. If you look carefully, you will see the horn-like spines on the fish’s right gill plate. It is these horn-shaped gill protrusions that led to this species getting both its scientific and common name. Photo ©Jackie Hildering. Same male as in the image above. Photo ©Jackie Hildering. Many of the photos below show how you the males lie with their flat heads directly upon a cascade of eggs. The clusters of eggs laid in the Spring allow me to find this incredibly camouflaged fish much more easily than I normally could. When I see a golden, orange or greenish shiny mass of eggs, I know a male Buffalo Sculpin has to be very near by. The bright colour of the eggs suggests that they might be toxic to many species, further protecting them from predation. The camouflage, in addition to reducing the risk of predation by bigger fish and seals, allows the Buffalo Sculpin to be a very successful ambush hunter of shrimps, crabs, amphipods and small fish. It has been suggested that they eat mainly algae since this has so often been found in their gut but I am willing to bet that the algae ends up in their stomachs as a result of the buffalo sculpins grabbing prey ON the algae! A cascade of eggs below this brilliantly coloured male Buffalo sculpin’s chin, April 1st., 2012 See below. He as still guarding these eggs on April 21st and was guarding other eggs on May 6th, 2012. The two differently coloured egg masses suggest that this male is guarding the eggs from two different females. April 1, 2012. The same male guarding eggs 3 weeks later. April 21st, 2012. Range: Monterey California to Kodiak Island, Gulf of Alaska. Most often found to a depth of 20 m but have been found to 227 m.
Whoa! Photo below is of one male Buffalo Sculpin guarding the egg masses of at least 3 different females. The following photos of male Buffalo Sculpins guarding eggs are intended to show how varied both the colouration of the fish and the eggs can be. April 7, 2012. ©Jackie Hildering. April 22, 2012. ©Jackie Hildering. May 19, 2012. ©Jackie Hildering. Buffalo Sculpin May 2018. ©Jackie Hildering. Buffalo Sculpin (and retracted Painted Anemone) May 2018. ©Jackie Hildering. April 7, 2019. ©Jackie Hildering. Amazing pictures Jackie, they are incredibly beautiful! Fish daddy’s are amazing creatures. Great write up and as always Great PICS!! Nature never ceases to amaze me!! Thank you Jackie for transporting me underwater with you! Wonderful pictures Jackie! 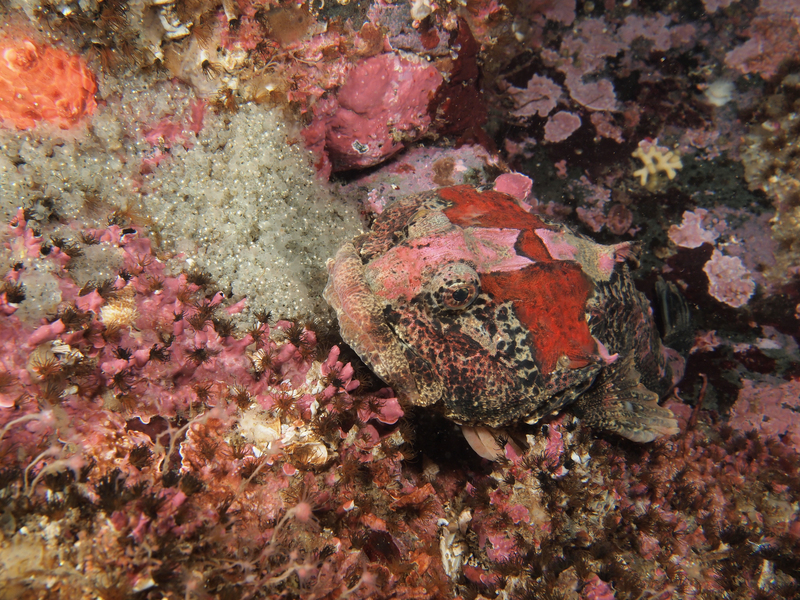 Camouflaged sculpins are a favourite of mine (one of many!) while diving. Such a treat to get a glimpse of the next generation!